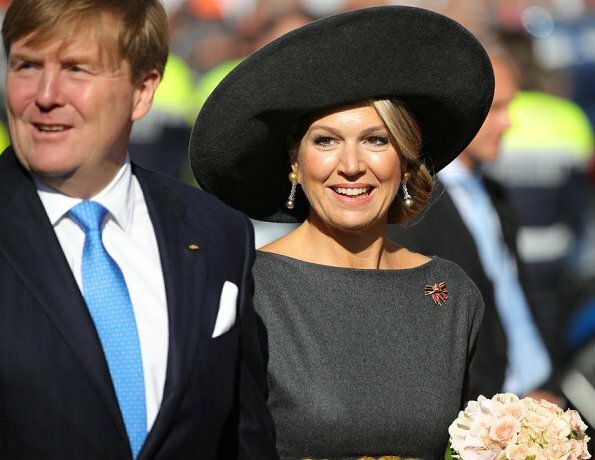 King Willem-Alexander and Queen Máxima of The Netherlands are making a 3 day state visit to Germany. 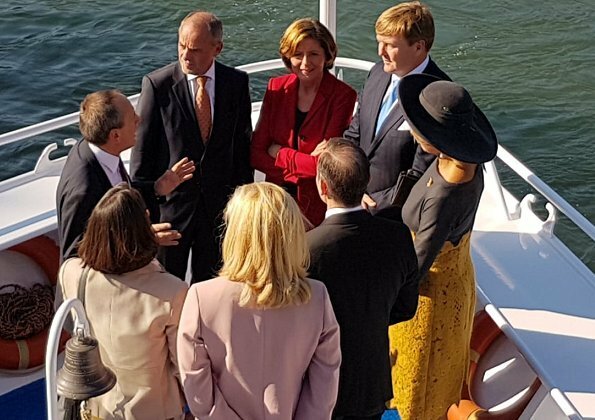 On October 10, King Willem-Alexander and Queen Máxima were welcomed by Governor of Rhineland-Palatinate Malu Dreyer and her husband Klaus Jensen with a state ceremony held at State Chancellery of Rhineland-Palatinate in Mainz. 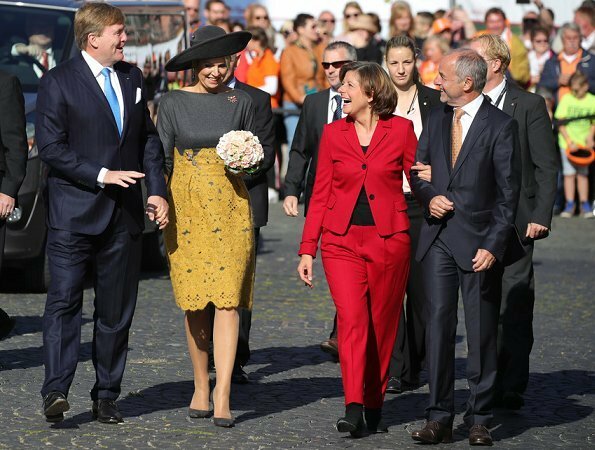 Afterwards, the King and the Queen attended a lunch at the Presidential Palace. 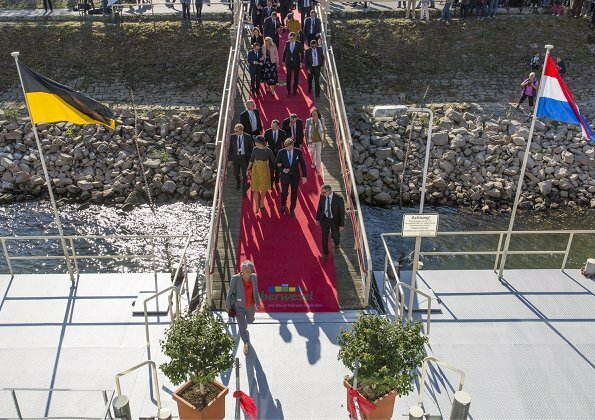 The theme of the lunch is "200 years of Raiffeisen". F.W. Raiffeisen, born in Rhineland-Palatinate in 1818, was one of the founders of the cooperative movement. The high waist up to the breastline, pleats, and shorter hem make this dress not very attractive. She has an amaizing jewerly collection, the spiders brooches yesterday and this beautiful multicolor pearl brooch, and the earrings, just wow!! I would like to take a look of her collection. The king and the queen look fantastic.They are my favorite royal couple. I really like the grey upper part of the dress but the yellow lace does not fit very well. But king and queen, hand in hand looks very adorable and friendly. 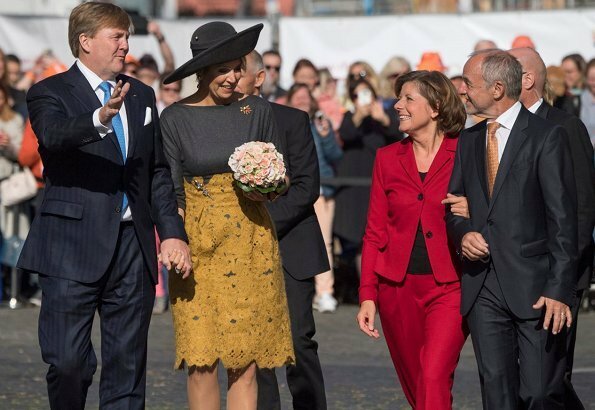 I think that Maxima´s dress would look lots better if a) the yellow part started at her waistline instead for right under her chest and b) the waist darts were omitted in favour of some sharp tailoring. I don´t mind the yellow colour, and I actually like the hem details in her dress. As for Malu Dreyer, the lady in red, I cannot understand the benefit of buttoning the jacket over the bosom and leaving all the other bottons undone. It looks both clumsy and unattractive. Suit jackets and blazers aren´t cut to be closed like that, and as a result they pull in weird places, and the silhouette is completely ruined. With a simple cardigan one can get away with that, but not with a tailored jacket. The red colour is great though. Actually , I like this dress very much ( for her). Love the combination of colors and the empire cut . Nice hat and fabulous jewelry, my pet peeve, as usual is the shiny pantyhose. I agree with you about the shiny hose. They have been bothering me as well. The goal is to have them look as natural/invisible as possible. Could it be that the shiny hose are actually a type of support hose? I agree with Anonymous 7:15 above - the dress matches that flag perfectly! Máxima looks so beautiful in these colours. The king and queen are so adorables! Today Mainz, tomorrow ?Love Maximas hat and jewelry shoes and bag are not bad either,but the dress is not my taste. She like's it and that is what counts. 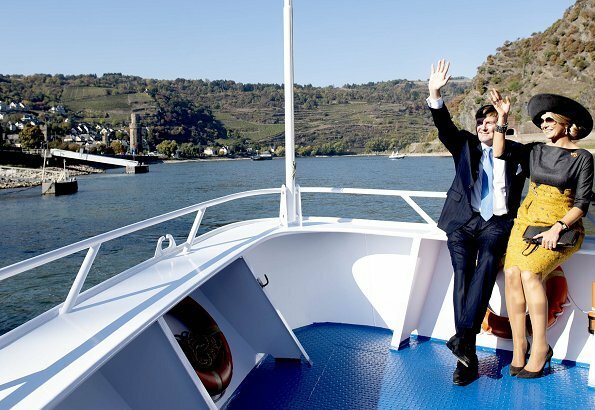 Tomorrow they'll be in Germany's oldest town, Trier. I'm looking forward to seeing and waving at them there :-). 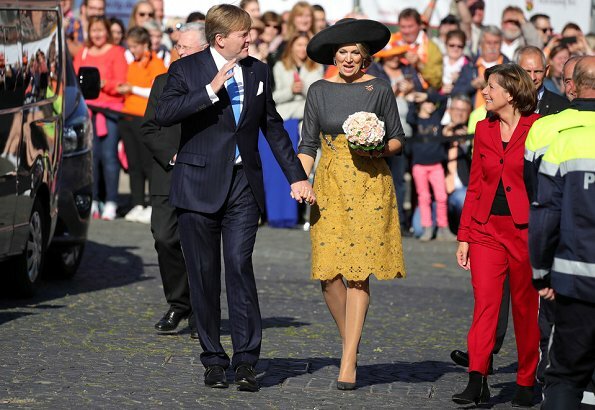 I like the colors of Maxima's dress, but not the dress so much. I love the brooch and its placement at the waist. I think the brooch at the shoulder is unnecessary. I was so distracted by the dress that I didn't notice her hair until it was mentioned above. I am so happy to see it styled nicely. 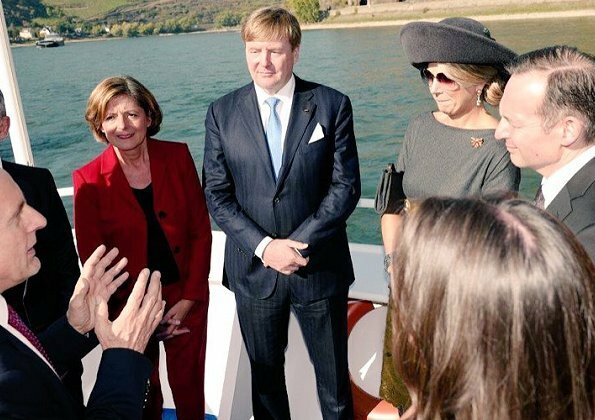 Lastly, it's lovely to see Willem and Maxima holding hands. I like it dress n colour... great for autumn! 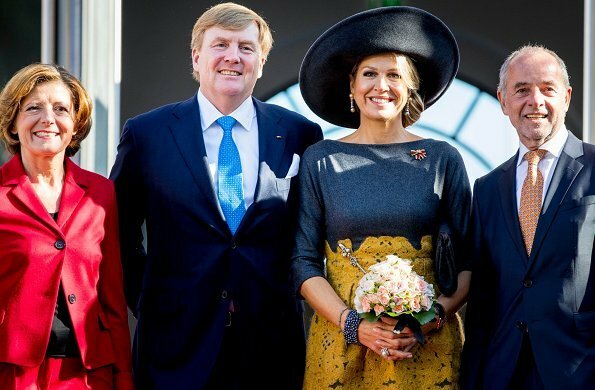 Lovely nod to wear the colours of the region, but a yellow hat and an all grey dress would have been better, with the jewels, of course.